MM-727 Very rare Purple Heart from the USS Jarvis. One of only 2 major US vessels to go down with no survivors during WWII. The Jarvis was present during the devastating attack on Pearl Harbor. 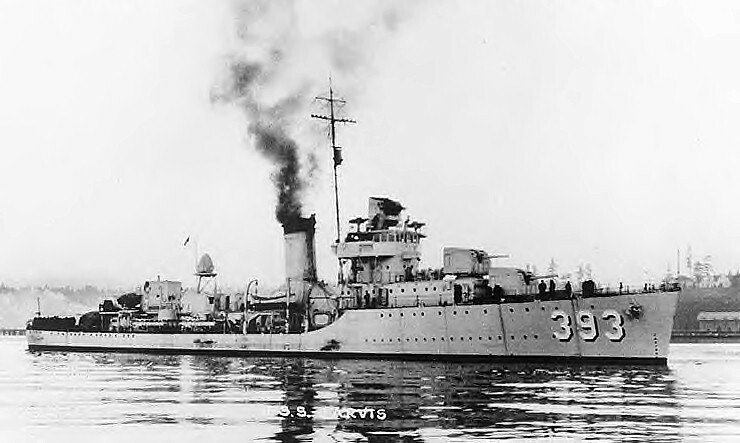 Moored next to Mugford in berth B6 of the Navy yard for minor repairs, Jarvis opened fire with 5-inch guns and machine guns and made preparations to get underway. Within minutes of the initial attack, her 5-inch guns were among the first to challenge the enemy raiders, and her gunners claimed four planes. During the battle for Guadalcanal, "Following a night patrol off the southern end of Savo Island, Jarvis returned to Lunga Point to screen the unloading transports. The warning of an impending air attack suspended these operations and the transports and their protective screen of destroyers and cruisers deployed in the body of water between Guadalcanal and Florida Island, soon to be called "Ironbottom Sound". When enemy torpedo bombers appeared around noon on 8 August, they met a stream of antiaircraft fire. Only 9 of the 26 planes penetrated the defensive fire, but they set the attack transport George F. Elliott ablaze and torpedoed Jarvis. Despite a 50-foot (15 m) gash in her side, she was considered seaworthy and ordered to proceed under cover of darkness to Efate, New Hebrides, escorted by the minesweeper Hovey. Apparently unaware of the order because her radios had been disabled, her commanding officer, Lt. Comdr. William W. Graham Jr., decided to steam to Sydney, Australia. Jarvis departed Tulagi at midnight on 9 August and moved slowly westward through "Ironbottom Sound". 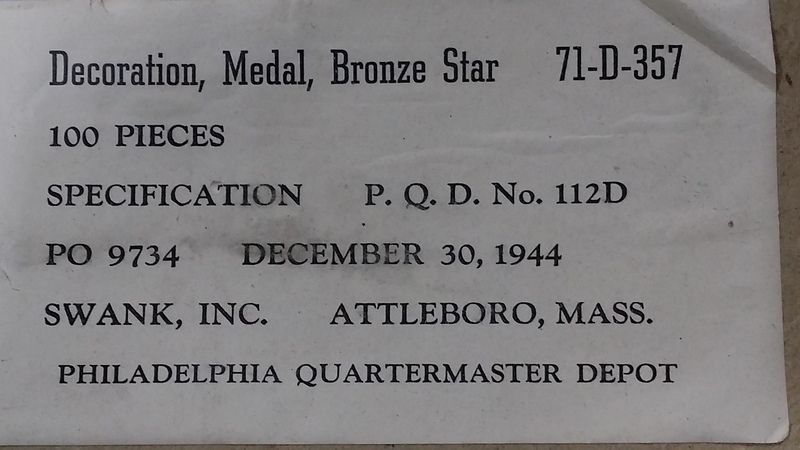 MM-615 Scarce small lot of WWII boxed Bronze Stars. Each medal is still wrapped in the original paper with box. Price is $35 each. MM-141 1940s Distinguished Service Cross, watered Silk replacement ribbon. $15 per foot. MM-119 Original 1930s-40s watered silk Distinguished Flying Cross Medal Ribbon, old stock. $15 for a 1 foot length. MM-116 American Campaign and Pacific Campaign ribbon. 1940s stock. $10 per foot. MM-115 Philippine Defense ribbon. 1940s stock. $10 per foot. MM-114 Presidential Unit Citation ribbon. 1940s stock. $10 per foot. MM-113 US Navy Sharpshooter Ribbons. 1930s-40s stock. Your choice of the 3 varieties. (Expert Rifle Sold Out) $10 per foot. MM-112 US Coast Guard Sharpshooter Ribbons. 1930s-40s stock. Your choice of the 3 varieties. $10 per foot.